(Reuters) - Kinder Morgan Canada Ltd's third-quarter profit surged as it recorded a one-time gain of C$1.31 billion from the sale of its TransMountain pipeline. The company said on Wednesday it expects to return about C$1.2 billion ($921.5 million) or C$11.40 per restricted voting share from the sale to its shareholders. 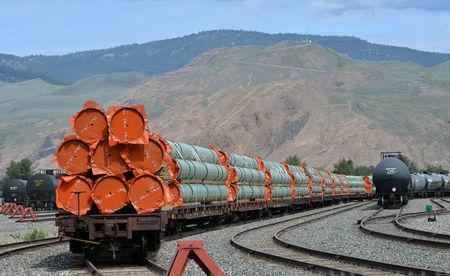 Its parent, U.S.-based Kinder Morgan Inc, closed the sale of the controversial Trans Mountain pipeline to the Canadian government for C$4.5 billion in August. Kinder Morgan Canada said net income rose to C$1.35 billion in the three months ended Sept. 30, from C$42.4 million, a year earlier. Its revenue rose nearly 10 percent to C$94.3 million. Separately, Kinder Morgan Inc reported a third-quarter profit of $1 billion, up from $387 million, a year ago.